You have invested time and money collecting and operating model electric trains. As with any investment, adequate and accurate supporting information is of extreme importance and value. Whether you are making a decision to buy or sell trains or simply want to learn more about the trains and the company that manufactured them, you demand certain qualities from the research and reference guides you consult. Accuracy, Completeness, Objectivity and Freshness are what distinguish the award winning works published by Project Roar Publishing. Project Roar Publishing has become the authoritative source of historical information on model electric trains. Our publications are based on actual manufacturer documentation and expert observations done by leading toy train historians. Accuracy is ensured through the use of rare original documents and the experts who base their writings on their study of these internal records. 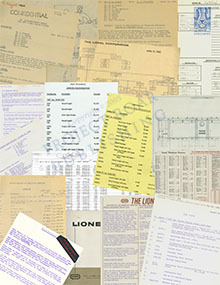 Manufacturer production documents list everything that came with an item or train outfit, including all variations, boxes, inserts/liners, envelopes, instruction sheets and other associated peripherals. This level of detail is included in all our publications. Project Roar’s publications set a new standard of objectivity for the publications devoted to model electric trains. Descriptions and listings are based on actual manufacturer documents as well as the careful observations of leading toy train historians. These documents provide the undeniable facts of what the manufacturer produced and marketed. Manufacturer production quantities are also used as a basis for determining objective rarity ratings for items and outfits.